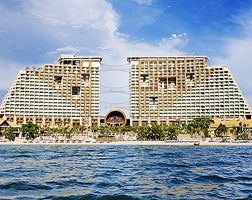 The four kilometre half-moon shaped Pattaya beach has plenty of life, with all kinds of activities and things to see. The Nong Nooch Garden 18 km south of Pattaya is a sprawling recreation park in a typical Thai setting, with traditional pavilions and gardens. There are daily cultural and elephant displays. Pattaya nightlife is legendary, and with good reason. Take your pick from hundreds of bars and night clubs. Shopping is another pastime at night. Koh Lan Island is 15 minutes off the coast by fast boat. Also known as the Coral Islands, you can laze on sandy beaches, go snorkelling or take a cruise on a traditional sailing junk. Built on the largest swamp on the eastern seaboard of Thailand, the 100,000 square metre Pattaya Floating Market is the perfect way to immerse yourself in Thai culture, and local food too, of course. Nine kilometres from Pattaya, the million-year-old Stone Park and Crocodile Farm, has beautifully-landscaped, elaborate flower and rock gardens, not to mention hundreds of captive crocodiles. Khao Kheaw Open Zoo covers a vast tract of forest. Here, you can see more than 200 species of local and imported wildlife living in their natural habitats. Look out for the night safaris by auto-tram. A more spiritual experience is yours at the Sanctuary of Truth. This compound by the sea at Laem Ratchawet is dominated by a gigantic temple-like wooden structure, over a hundred metres high.